The near completion of this project is almost as exciting to me as the Migration sword I'm finishing so I thought I would share this here. I DO NOT make these for sale.. I'm only showing it for fun and because, of all people, you folks here might appreciate this weapon. I'm very excited because holding this thing that I have made is the closest thing I will ever get to holding such a historically important object and it is a dream come true to finally have successfully made one. It is an English warbow made from yew. It started from a quarter split yew log and I've been carving it down slowly with axe, draw knife, spokeshave and scrapers since last fall. These bows were largely (but not always) made from yew which has the admirable characteristic of possessing the two wood types most useful in a bow.. the tension-resistant sapwood and the compression-resistant heartwood. The sapwood is left intact along the back and the shaping of the bow corresponds to the idiosyncrasies of how the thing grew. The resulting bow is lumpy and organic. So my bow is pretty much what they were like. And I'm ecstatic to finally have one. Mine has buffalo horn nocks and there is debate about how many of the originals had them. It seems like the horn-nock advocates are winning.. so mine has them and I can't imagine an English longbow without them. I didn't get the draw weight I was originally shooting for at 130#.. but in the end I'm better off as I'm wounded right now from tillering and test pulling this thing at it's current 100# weight. I will probably not be able to shoot it for a week or so until my elbow and shoulder heals. I will post some more pictures as I polish it out. As well as get some full draw pictures (when I can). I'm planning to make some ranging or bearing arrows for long distance shooting. And maybe a fire cage arrow. Oh yes.. I can't recall it's length right now.. but it's considerably taller than I am. And I have named it 'Branch'.. in opposition to another bow that I'm finishing which is called 'Twig'. That is a pretty cool bow too. I will get some pictures of that one as well. Very nice, Scott. Welcome to the world of Warbow archery. Looking forward to seeing the full-draw pictures. I can't tell from the photo, did you go for front nocks or side nocks? I just got a picture of it at 22" or so on the tiller tree. Will post that soon at least. I think it's actually the pulling on the tiller tree that got me! As to the nocks.. well I went with front nocks. I WANTED to try side nocks.. but I just wasn't comfortable with it for some reason. I've never used them or seen them first hand.. so I just went with comfort for me. But I understand that they are easier stringing for heavier bows. Anyway.. since I didn't quite make my target draw weight.. I will probably make another in a true warbow draw weight and then go for side nocks. Well done mate, you tackled that knot then? Did you plug it in the end or leave it open? And did you leave the deflex or whip some heat onto it? Looks lovely at brace, congrats. Yeah I plugged the knot. So far it doesn't seem to affect anything at all. I left the deflex. I liked the idea of 'sweet shooting' and 'easier to string'. I'm sure I will be making another but I'm happy with this. I haven't gotten to shoot it much due to my damn elbow. I haven't actually taken it to 28" on the tiller tree yet due to my elbow.. so I have a feeling it's higher than 100# for my draw length. I will try to get a tiller tree pic up tonight! Actually.. I need to. I may need some advice. I have a feeling I might need to make a few more adjustments to get it to true full compass. 28"!? You need to bring it down to 32" before it's a warbow otherwise it's a just a very heavy target bow....! Hopefully you're not trying to pull it like a target bow/hunting bow otherwise you'll definitely hurt yourself and never get there. I may be wrong but I think most guys can achieve a 32" draw if done properly. You should be proud of that bow though, it wasn't the easiest stave to start with and it looks beautiful now! As Will says, I'd tiller it to at least 32". 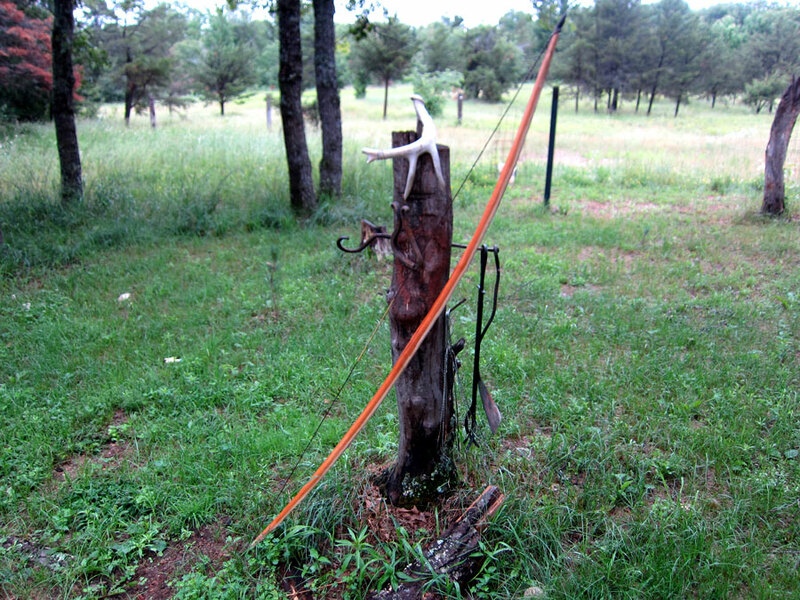 With a compass bow you need to get the whole limb bending to get the most performance out of the bow. If you are drawing short - and particularly if the bow is very long - then the limbs won't be working fully, especially the limb tips. I've seen quite a few very long bows (80" and over) drawn to only 28" and they have very poor performance because the limbs are hardly bending. Naive archers then believe they need more draw-weight; which is a vicious spiral towards failure and injury. I draw to 33" (and then some) and prefer bows around 74" - 78" - the shorter the better, IF the wood will take it. Okay.. Thanks guys. That helps a lot. This is the first time I've tillered a full compass bow. I've been hesitant drawing it like that.. probably because of the fear related to the knot. But will remedy that today. Thats looking great, got to be at around 32...its amazing what the last couple of inched does for velocity. I am a tiddler at 90lb at the mo and the occasional 100lb pull . It is certainly not to be rushed. good luck and happy shooting. forging soul into steel . www.owenbush.co.uk the home of bushfire forge school of smithing . Thanks for posting Owen. I'm really jealous of your warbow group out there. It will still be a very nice how however. Very cool. Truly a bow to be proud of. May I ask what your yew source was? All the staves that I have been able to find were quite expensive. I have long had the same dream to make a true yew longbow. Congratulations on your realization of the dream. Thanks Scott. I honestly don't know... except that it was somebody in northern Cali. I had a friend who had a friend. But it was still expensive... $225 (which I'm paying for in blade work). Yeah it has been a goal of mine for a while.. which is not totally realized yet since I'm coming quite a bit under my target wait. But now that I have a good yew bow I will probably do a warbow in a suitable white wood.. which I'm hoping will be less expensive. Look at it this way: you've now got a good bow to practice technique with. Set yourself some challenging targets (no pun intended) like reaching 200 yards with a Standard arrow (and that's a measured 200, not a 'that-looks-like-about' 200, which is often a considerable amount less!). That should be achievable with a good Yew bow. It'll force you to improve your technique; and that will pay massive dividends when the heavier bows arrive.